NOTE: Apologies to my classmates for not having this posted sooner. I hope you all get a chance to take a look at this before class Wednesday–it’s a very cool website and a landmark game in the history of video games. In a week dedicated to exploring and dissecting the many varieties of digital content and how the digital intersects with the physical, it is fitting that we turn our attention to Mystery House Taken Over (MHTO, for the sake of brevity), a website built in homage to the smash-hit and groundbreaking 1980 adventure computer game Mystery House. The game was so popular and influential that even today, nearly three decades later, amateur programmers and game designers continue to create new mods and versions of it. 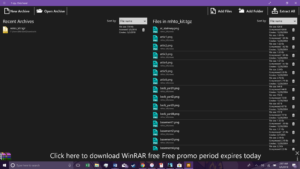 In fact, as recently as 2016 a Mystery House app debuted on the smartphone; now a copy of the original can downloaded in seconds from the app store and played right on one’s phone. MHTO, however, was born during a lull in Mystery House’s popularity and played a decisive role in ensuring that its data and the many works derived from it remain safe in a digital vault. MHTO is run and maintained by a small cadre of seven or so volunteer bloggers, academics, writers, and programmers that are relatively well known within this niche of the digital world, as many are themselves veteran authors and/or programmers of critically-lauded works within the “interactive fiction” genre—some in the text-based, exploratory vein of Mystery House, others completely and wholly unique unto themselves. The site offers a public and (commendably) free download of the original Mystery House game, but this is just the tip of the iceberg. Though simple and unadorned, MHTO’s website also hosts and offers hundreds, perhaps even thousands, of “modded” (professionally- or user-modified) variants of the original, as well as the tools and information necessary for one to create their own mods for Mystery House, or even (in theory at least) their own unique game. MHTO is essentially a free, one-stop mod shop for both amateur and professional game designers looking to build something new out of the discrete base components that together comprise Mystery House. However, to best understand MHTO, one must first understand at least the fundamental aspects of its foundation. So, before we dive into the nitty-gritty of the site itself, let’s take a moment to briefly look at the birth and legacy of the historic videogame that started it all: Mystery House. Mystery House’s official cover art. The plot of Mystery House, like its graphics and structure is relatively rudimentary, even cliché, by today’s standards. The game opens with the protagonist standing outside of an ominous Victorian mansion (pictured below), the game’s setting, and upon entering finds himself locked inside with seven other characters: Tom the plumber, Sam the mechanic, Sally the seamstress, Dr. Green the surgeon, Joe the gravedigger, Bill the butcher, and Daisy the cook. 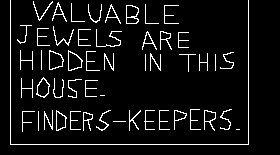 It is soon discovered that a cache of jewels and riches is hidden somewhere in the house (with a “finders keepers” policy no less), initiating a frenzied search to find it before it’s claimed by another. 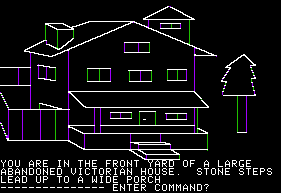 The mansion in which Mystery House takes place and as well as the story’s opening graphics. With a locked door at his back and no choice but to move forward, the player joins the others, who split up to cover more ground. As the player makes his way through the mansion he stumbles across the bodies of the other house guests one by one, at which point the real plot is revealed. Whether it’s one of the other seven guests or some unseen inhabitant of the house, someone used the ruse of jewelry to lure the others and has been slowly but surely eliminating them one by one. Simply put, our protagonist is locked in the mansion with a murderer with only one goal: using clues, caution, rationality, and logic, unmask the murderer before he makes you his next victim and escape with your life. Left: the mysterious message luring the group inside. Right: the entire cast of characters assembled in the foyer. Admittedly it’s difficult to identify who’s who, considering the five males are exact clones of one another, as are the two females. Though groundbreaking in its field, the artwork is… shall we say, rudimentary. Though crude by today’s standards, Mystery House’s mechanics worked in much the same way that later graphical adventure and puzzle games would, like the hit 1993 adventure game Myst. Because of technological limitations of the time, the player controls Mystery House’s protagonist by way of a binary input decision tree, which in practice works much like a very long series of “yes-no” questions: “do you want to go upstairs or stay on the main floor? Upstairs: do you want to investigate the master bedroom or go back downstairs? Bedroom: a note on the dresser offers a clue to the treasure’s secret location, do you share this with the others or keep it to yourself?” This allows the player at least a modicum of freedom and choice at a time when most computers simply lacked the complexity, processing power, or memory to engineer or host what’re known today as “sand-box” style games à la Grand Theft Auto, Skyrim, or Fallout—the type of game that offers an entire (albeit bounded) world to explore at one’s leisure. Another groundbreaking aspect of Mystery House, and that which it’s best known for, is that it was the first game of its kind to integrate a text-driven adventure narrative with accompanying digital illustrations of the characters and surrounding environment. Though some argue that it is the first game to integrate text-driven narrative with graphics, period, several “dungeon-crawl” RPGs preceding Mystery House had featured basic graphics linked with text. 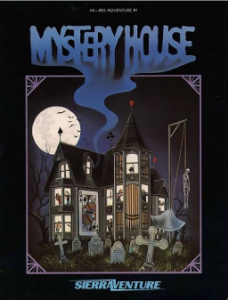 Mystery House was, however, the first interactive-fiction adventure game to integrate text with graphics on a large scale, and did so well enough that it sold tens of thousands of copies (possibly as high as 80,000 units) by the mid- to late-80s, earned the attention of influential members of the video game industry, and has repeatedly been honored by leading tech and gaming magazines like GamePro and Computer Gaming World as a recurring member of “best” and “most innovative” videogames lists. Mystery House was conceived of, written, and illustrated by a woman named Roberta Williams and programmed by her husband Ken in the late 1970s. The Williams were inspired after playing a game called Colossal Cave Adventure and, discovering that few if any similar games existed at the time, decided they would simply make their own. Roberta drew influence from a wealth of literature in creating the game’s plot, none more so perhaps than Agatha Christie’s murder mystery And Then There Were None Alive. Since then (somewhat ironically) many games have drawn inspiration from Williams’ work and include small nods, winks, and Easter eggs relating to Mystery House. The couple worked well as a team; Roberta was the creative force, designing the plot, writing the dialogue and textual descriptions, and creating over 70 illustrations for use in-game. Ken, well-versed in programming and eager to make use of the new Apple II computer’s processing power, handled the digitalization of Roberta’s work, translating his wife’s narrative into a digital format meant to fit on a single floppy disk. Originally marketed for sale by mail order at $24.95, the Williams were shocked to discover that demand was rapidly outweighing supply and quickly sold over 10,000 copies between 1980 and 1982. By 1982 the couple had founded a company called On-Line Systems, which quickly changed to Sierra On-Line, SierraVenture, and ultimately Sierra Entertainment, which only recently dissolved in 2007 following its acquisition by Activision. Under the SierraVenture name the Williams couple re-released an updated copy of Mystery House in 1982, boosting sales higher than ever. By 1987, when the Williams released Mystery House to the public domain, they had sold over 80,000 copies, and later a Japanese company would pick up the title for re-release in Japan, generating similarly impressive and surprising sales overseas. 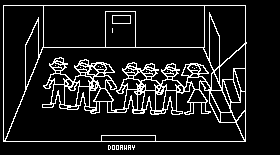 Since the Mystery House code and software were now free to use by the public, amateur programmers and gamers quickly took advantage of this access to the game’s internal coding and dissect that code almost line by line. This allowed developers and programmers wishing to follow in the Williams’ footsteps to use the underlying structural framework of Mystery House as a foundation upon which to build one’s own graphical adventure games. While the near-simultaneous birth and rise of the Internet in public life certainly facilitated and fanned the flames of this phenomenon, this early gift from the Williams’ to early game development cannot be overlooked. By the new millennium, though the game and the growing number of related mods could still be found online, enthusiasm for this now ancient tech had dwindled precipitously in the face of powerful dedicated gaming consoles like the Nintendo 64, PlayStation, and Xbox. However, many still remembered Mystery House with a fond nostalgia, and by the early 21st century the videogame community’s desire to preserve this relic of early gaming reached the attention of New Radio and Performing Arts, Inc (or NRPA), an organization dedicated to archiving and preserving new and experimental artforms like radio art, sound art, and net art. In 2004, with funding from the Andy Warhol Foundation for the Visual Arts, NRPA commissioned the creation of an official online archive to house the original Mystery House and its countless derivatives: The Mystery House Taken Over project, which can still be reached here http://transition.turbulence.org/Works/mystery/. Regardless of whether NRPA commissioned to honor its mission of preservation or simply to boost traffic to its official online archives at www.turbulence.org, the MHTO project has since flourished and has remained online and available to the public for nearly 15 years since its commission in 2004. Returning to the current Mystery House website, MHTO’s primary purpose is two-fold. First, MHTO serves as a relatively simple and publicly-accessible archive for the countless sequels, spin-offs, remakes, parodies, re-imaginings, original works and other Mystery House mods that have emerged since the original’s 1980 debut. Some of these mods were created by Mystery House’s original designers while others are individual user contributions or collaborative works; unsurprisingly, this means that quality varies wildly from mod to mod, but if one is willing to sift through the duds there are true gems of digital artwork to be found—works that are not only aesthetically pleasing, but technically sound and narratively compelling. MHTO’s archives are impressive enough in and of themselves, but it’s the website’s other main service that sets it apart and makes it such an interesting specimen to study: that is, providing the tools and the means for both amateur and professional game designers and enthusiasts alike to download the base components of the original Mystery House (or any of its modded derivatives) and use them to create their own original digital project. 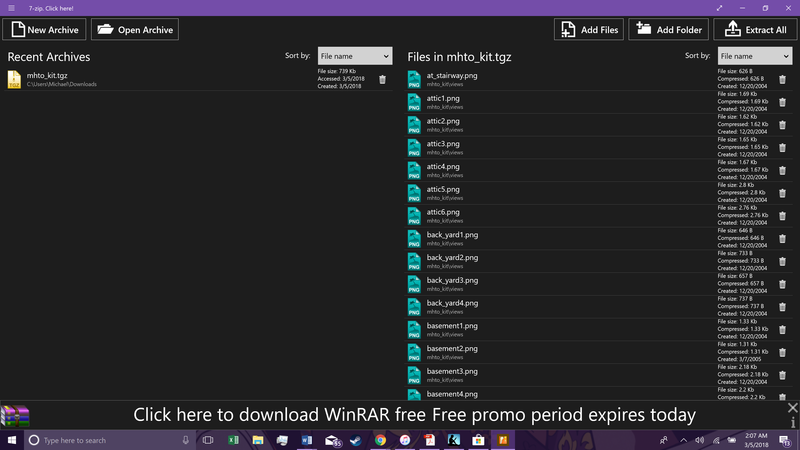 The process can be somewhat overwhelming for those not familiar with the process, requiring the downloading of several third party programs—to name just a few: 7-Zip (readily available free file decompression software, pictured below), a “Glulx interpreter” like Gargoyle (essentially a player for .blb, or Blorb format files), and most importantly, MHTO’s proprietary creation tool, the MHTO “Occupation Kit,” which contains every single known file, folder, picture, and line of coding of the original game. Using the 7-Zip program to extract and decompress these files, compiled in the “MHTO_kit,” one can easily obtain a full inventory copy of the game’s core commands and individual graphics (pictured below); unfortunately, making effective use of these discrete parts and reassembling them into a working game format is the challenging part. However, once one has familiarized oneself with the necessary tools, the MHTO Occupation Kit allows those with the time, interest, and skill to create whatever sort of interactive digital art or videogame the author/artist can imagine—within reasonable technological bounds of course. Even the two Williams’ quickly discovered that much of what they had wanted to include in the game was simply too much data to store on the floppy disks available in that era). However, given the level of raw processing power available in even today’s mid-range computers, the speed with which that power is increasing over time, and the democratization of digital archives, assets, and information the boundaries defining the possible and impossible in the world of the digital continue to expand, blur, and even fade away as time marches relentlessly forward.